This was a pretty average week for my Operation Melt journey so not a lot to share. We did reopen our lake house this week which gives me some more variety in scenery when it comes to running. Unfortunately it also gives me a new set of challenges on the food side and I tend to snack more and eat less healthy meals at the lake. But I know how to manage that! As you know I am in weight maintenance mode now and stopped the weight loss at the end of 2018. When I stopped I was, and still am, likely at my lowest healthy weight. That means that my body is more prone to daily weight fluctuations driven primarily by my daily balance of water and sodium. A weight loss journey is physically and mentally tough but so is maintenance mode. Maintenance is just tough in different ways that mostly exist in my head. For 18 months I stepped on the scale nearly every morning and saw my weight decreasing. I had set a goal, I was measuring progress every day and was rewarded with a daily dose of measurable success. This is like a powerful drug to my high competition, high achiever, goals focused brain. Daily measurable success is not a permanent dependable staple in life. In real life, or maintenance mode as the case may be, our days are filled with ups and downs. It is possible that you will go many days without a measurable “win” in your life. For somebody who spent 18 months with daily wins this could feel very uncomfortable. It could feel like you are sitting still or that you are failing – both are very similar in my achiever/competition brain! Fortunately I have been able to see some wins in other areas. I have even taken my own advice from this week’s Reflections on Leadership and created some wins. But I am also working on being ok with days that really are just maintenance as uncomfortable as that is. Lesson Learned: if you are going through a major transformation where you get to see wins daily, enjoy it. There will be a time when you return to “normal” life and the wins come less frequently. During the journey it is important to remind yourself that this is a project so that means it is a temporary endeavor and will have an end date. 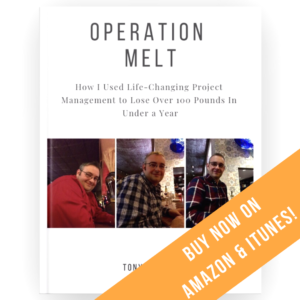 My book, Operation Melt: How I Used Life-Changing Project Management to Lose Over 100 Pounds in Under a Year, slowly continued selling this week. I tested my first ad campaign (a tiny one) but it really didn’t do anything but teach me how it works. I also got my first Amazon product review and I created my author page. One area of notable book success came on Friday. I unexpectedly discovered that Amazon had listed me as their #1 new release book in the project management category. That felt like a big win to me and was very exciting. Also my first “proof” of my paperback has arrived and I will get to look through that on Sunday evening. I am considering releasing my first paperback through Amazon’s print on demand service this week. I just need to see if I think it loses any of its impact if the interior pages are printed in black and white. There is a significant cost difference and printing in color may price it out of a convenient range for readers. Short story: I am expecting to release the paperback very soon! Lesson Learned: keep your eyes on why you started the journey. I was getting frustrated because my book wasn’t selling faster when somebody asked me a big question. “Did you really write this book to make money?” No, no I didn’t. I wrote it to tell my story and to prove to myself that I could write a book. Most of all, I wrote it to help other people. That doesn’t require selling a million copies. In last week’s post I talked about how it is spring time and that means fitness is easier. Well this week was even nicer and I was even more active. Every day I tried to run or at least go for a long walk. It was amazing! 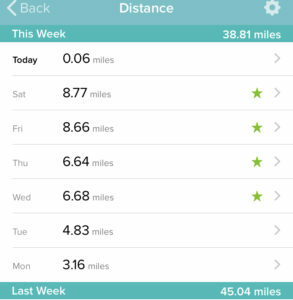 I covered some serious distance and, if it wasn’t for the rain this morning, I would be on track to meet or exceed last week’s totals and I ran a 10k last week! I am very happy it is spring and that I am able to ramp back up the outdoor activities. I really missed the sun and the warmth and not having to dress in layers to go for a run! 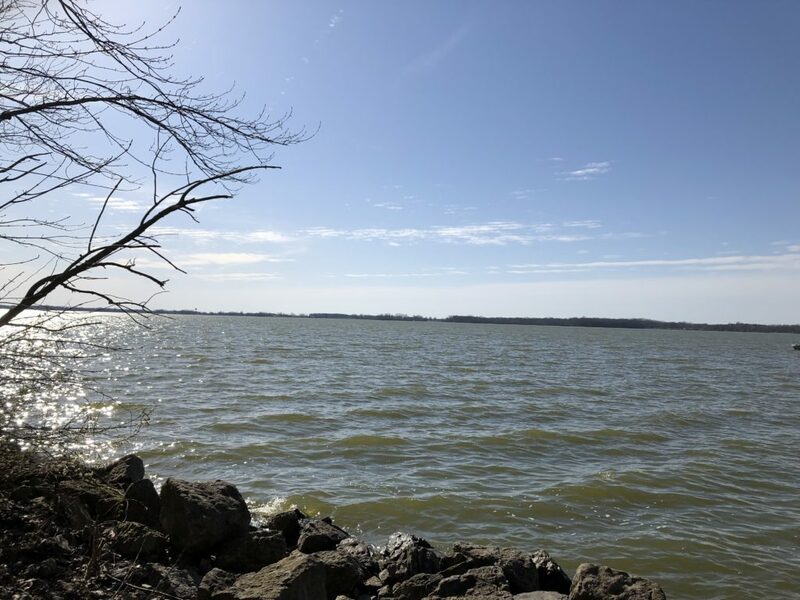 Plus spring time means it is lake time and I get views like this when running. Lesson Learned: it is easier to enjoy the exercise when you have great weather, warmth and nature is in full bloom! As many of you remember from last year my first ever 5k was one that I hosted. Last June I hosted the Operation Melt First Time 5k at the Scioto Audubon Park. This was an informal race of just a small group of close supporters which benefitted a nonprofit. It was no frills, no medals, no shirts, no closed course, etc. It was just a group of Operation Melt supporters getting together for a 5k run. Big news: I am going to host my Operation Melt 5k again this year! I plan to host the race on 6/15 – which is the anniversary date of my decision to change my life. It will be at the Audubon park again and it will be an informal 5k again. I really like these small, informal races! More information will follow soon. If you want to be kept in the loop, please make sure that you are a member of my email list. Thanks for reading and have a great week! Reflections on Leadership is my weekly article series reflecting on what it means to be a great leader. I hope that these thoughts can help you with your own leadership development journey. To create a world where goals never die of loneliness. We all have bad days or days where things don’t go the way we hope. Recently I went through a few days where it felt like nothing was going right for me. I had some setbacks at work that caused me to question myself. Some of my personal goals hit a rough patch and weren’t making the progress that I had expected. And, without getting overly specific and boring you, I just couldn’t seem to get a win. For somebody as goal-oriented as me and who measures his own performance daily this is not the most motivating or satisfying situation. One night after dinner I decided that I wanted to take my mind off the situation. 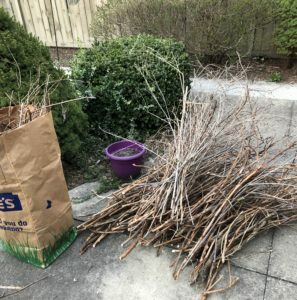 I turned on a podcast and started tearing out an overgrown bush in my back yard. This bush has annoyed me for years and I was planning to call in a professional this summer. But I decided to tackle some of it myself. About 90 minutes later most of the bush was gone and converted into 8 bundles of sticks and 2 bags of brush and the yard was clean. When I looked at the results I felt pretty good. I felt so productive and it makes me dread that area of my backyard a little less. This situation got me thinking about leadership…. Great leaders create wins. The best leaders look for opportunities position their team members for success. They help break bigger projects into smaller efforts that can be completed and celebrated along the way. They look for quick wins within longer term initiatives. They also give their team members opportunities to succeed in side projects. 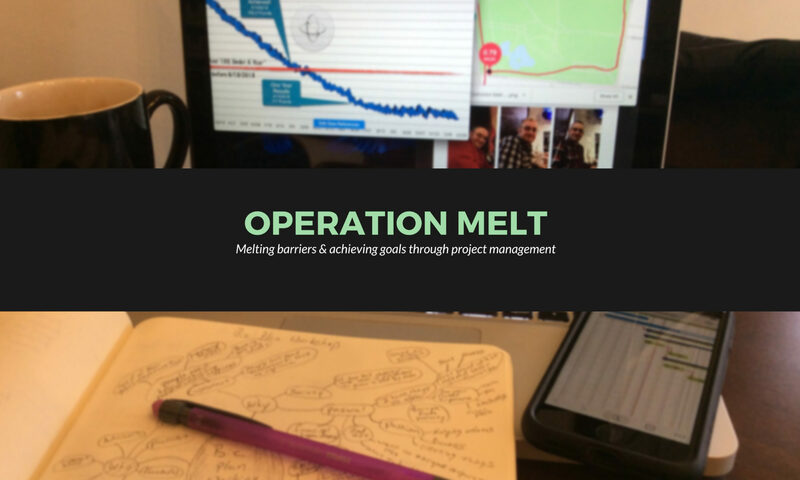 I discuss the motivational value of wins in my book: Operation Melt: How I Used Life-Changing Project Management to Lose Over 100 Pounds in Under a Year. One of the ten lessons I learned through my transformation journey is that nothing motivates more than results. Here is an excerpt from the book that describes this situation. I think of my motivation like a success snowball. I work hard and start seeing results. The results make me happy and make me work even harder. This harder work produces bigger results. Then the process repeats itself until I am unstoppable. This is a big part of how I hit my goal in nine months instead of the year that I set out to achieve. Call to Action: help your team experience the success snowball! Provide opportunities for incremental wins as often as you can. 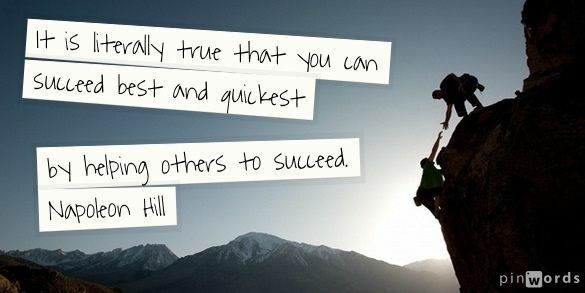 Then celebrate the wins to help keep everybody motivated and optimistic about their progress. Just make sure that the wins are authentic and not staged because honesty is a prerequisite to great leadership. 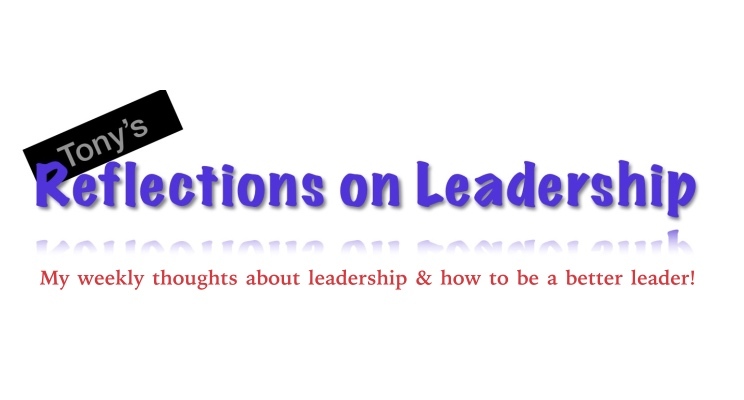 Thank you for reading and please feel free to share your perspective on this topic, my Reflections on Leadership series or anything else via a share on social media or message me directly. 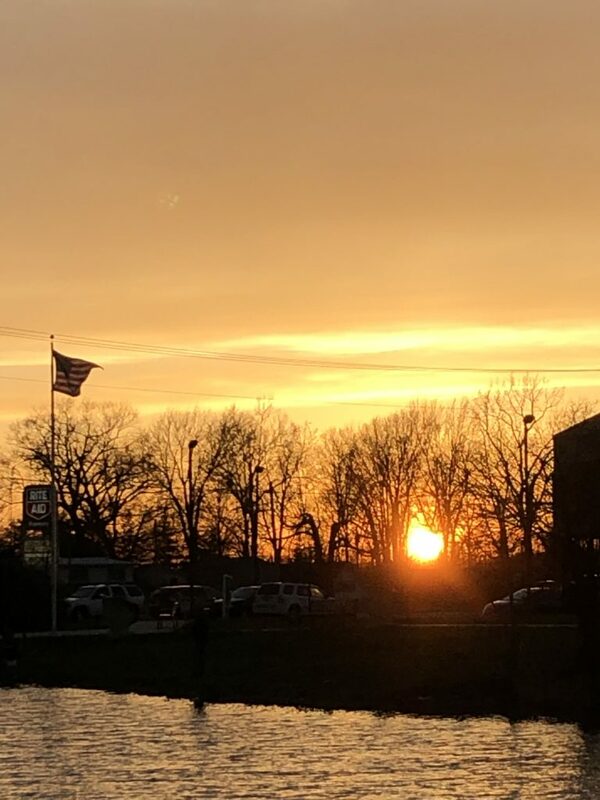 Week 94: Spring Time is Fitness Time! Spring has really sprung in Columbus. We had our first 70-degree day this weekend and I have had several outdoor runs and walks without long sleeves or a jacket. That means I can finally start enjoying outdoor fitness again and not a minute too soon. Unfortunately I have backed off a bit too much on my exercise-rich life and need to get back into full-on athlete and beast mode. Don’t get me wrong, I am still super active but I am just not pushing myself as hard as I know I can and should. With the full emergence of spring I have an opportunity to make this better. But, for now, I will share my updates from this week in my fitness journey. I am running the Cap City Half Marathon in just 20 days! It is so close and that is a slight source of anxiety. Have I trained enough? Am I ready? Will I have a repeat of the terrible cramps from my first half marathon? All the questions that my brain likes to focus on. The logical side of me knows that I am ready. I have run half marathons either organized or by myself 4 times since August. Just two weeks ago I ran a solo half marathon and achieved my stretch goal time. So I am pretty sure I am ready. This weekend I ran my last long run before the half marathon. 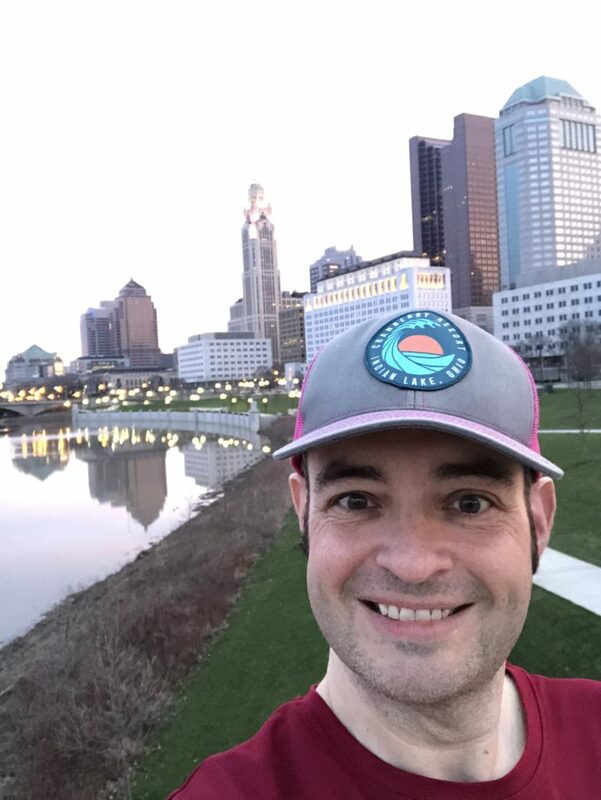 I ran the second race in the Scioto Miles racing series Sunday morning on the Scioto Mile on the riverfront in downtown Columbus. The first race in this series was a 5k that I ran on St. Patrick’s Day. For today’s race I upped my distance to a 10k. My strategy was to run this nearly quarter marathon distance using my marathon pacing strategy. For the next half marathon I plan to alternate running and walking just like my previous half. But unlike last time, where I did one mile run followed by one mile walk, I am planning on speeding things up a bit. I am planning to run 2 miles and walk a half mile and continue alternating for the full 13.1. During my run segments I plan to try to stick right around 10 minutes per mile and no faster than 9:30 per mile. This should give me the right blend of speed and endurance. At the October half marathon I finished in 2:44 and my stretch goal for this race is 2:30. Today’s run went pretty well with the exception of one big mistake. I ran too fast! When we lined up I went to my normal pace group – the 9 minute mile group. I stayed with them for the first 2 miles which sometimes meant I was running in the 8:30 to 8:50 range which is definitely faster than I wanted to run. I crossed the 5k line at just one minute slower than my last 5K which meant I was going way too fast. 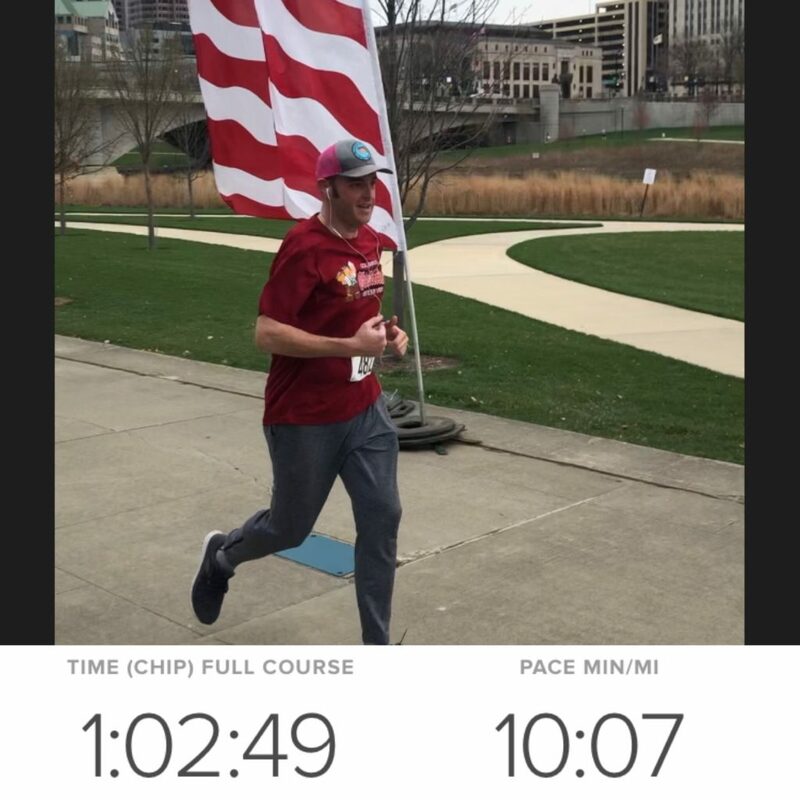 I averaged a 10-minute mile for the whole 10k race. That is a great, fast pace for a 10k and I would normally be happy with that. But my goal was to practice for my half marathon and that was not successful. If I run like this in the half I will not end where I want to end or I may not end at all. Lesson Learned: just like you can’t eat on autopilot, you can’t just exercise on autopilot. If you have gone to the trouble of building a plan, stick to it. Also I found another interesting mental aspect of the race. During the first 2 miles I was running with the 9 minute pace group and was sticking with them. I was doing great and I was going fast! Then I hit the 2-mile mark and it was time to slow to a walk. Next thing you know all of the people I was just hanging with at my fast pace were now out of sight. Even worse, the people I was ahead of in the 10-minute pace group and beyond were also passing me. Then some of the spectators were cheering me on because they thought I was struggling and that was why I stopped to walk (reminded me of my Reflections on Leadership from 8/29 – Leaders Know their View is Limited). My competitive side starting kicking in and it made it hard to be happy walking. I wanted to be running! 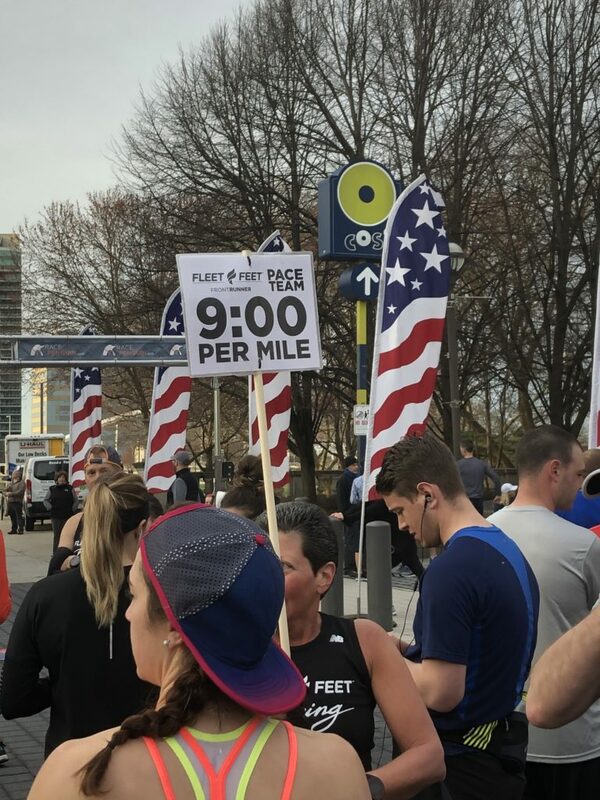 I wanted to prove that I am faster than the people behind me (most of which were only doing a 5k, not a 10k) and that I deserve to be in that 9-minute pace group. I shorted myself a bit on my first half-mile walk and started running after just .4 miles. I was not there to compete in this race I was there to practice for something bigger. But my brain didn’t like that idea! Lesson Learned: don’t let the emotional side of your brain talk you into feeling like any less of an athlete and don’t let it convince you to abandon your plan. One other fun detail – the temperature at the start of today’s race was 25 degrees warmer than the race just 3 weeks before! Today’s 10k run was the second race in the Scioto Miles racing series. This was a fantastic series and a great deal. The package included 2 races with your choice of distance for each: 5k, 10k, 15k. A pair of running shoes. Two shirts and two medals all for $125 (which is about the price of the shoes alone!). 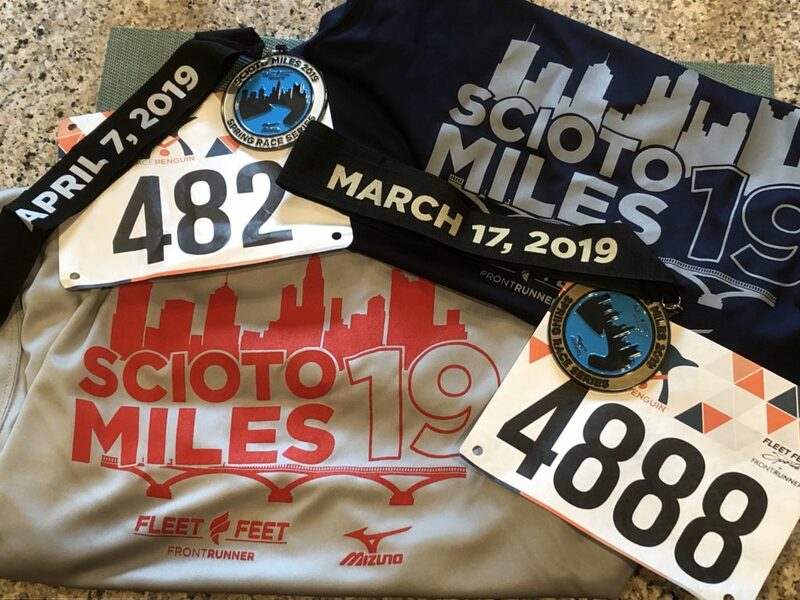 The goal of the Scioto Miles series is to help runners train for spring races and the Cap City Half Marathon in particular. My buddy Steve and I ran both races together. We did the 5k together in March and I increased my distance to the 10k for today. The racing series is very well-organized and managed by Fleet Feet Columbus. The online registration was simple. There was a pretty long window for shoe pickup at Fleet Feet in Lewis Center and 2 separate packet pickup dates at the same place. As an alternative participants could choose day-of packet pickup. This option is great because Fleet Feet in Lewis Center is a terribly inconvenient location for me since I live in the downtown area. If I were to suggest an upgrade in the process it would be to allow shoe and packet pickup at any Fleet Feet or Frontrunner location. The course for this racing series is the running path at the Scioto Mile along the Scioto river in downtown Columbus. The course was a 5k loop that you run 1, 2 or 3 times depending on your distance. I personally don’t really like that kind of course because you cross the finish line but then have to keep going again. A total mind F for me. But this is the most logical and practical way to run this race of variable distance so it is exactly the right choice and I just need to get over myself. The course is beautiful! 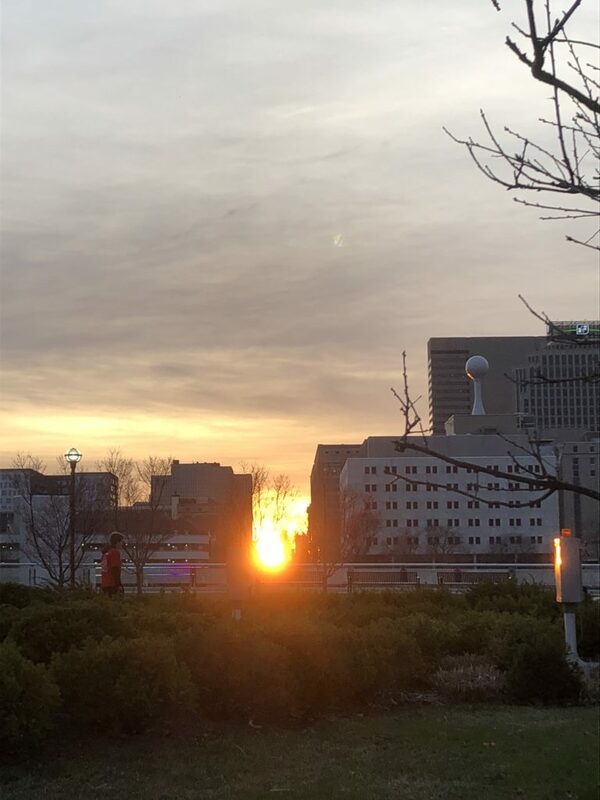 I love watching the sunrise over the buildings downtown. The birds and wildlife around the river are amazing. The bird “remnants” on the course aren’t as good but what are you going to do, we are guests in their home? Plus it really wasn’t that bad, just a couple of spots to dodge. Not at all unpleasant. As a training course this race is perfect. There is a mixture of uphill, downhill and flat terrain which is great preparation for running through the various neighborhoods that comprise the Cap City Half Marathon course. Finally, the race starts with a half-mile kids run before the grown-ups have their shot. The kids are cute and are working hard which is a big motivator. Plus I love to see kids focusing on their physical fitness as kids so they don’t have to go through a weight loss journey in the future like I did. And some of them are pretty darn fast. 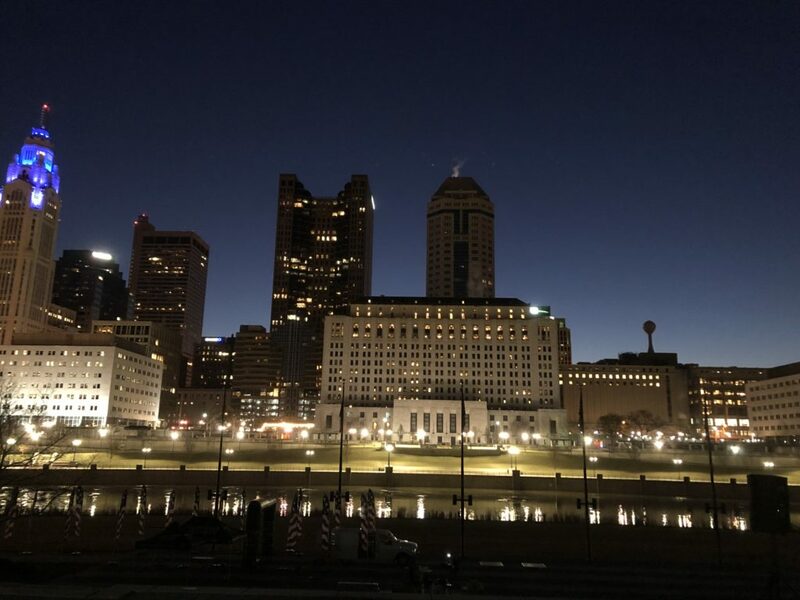 Lesson Learned: the Scioto Miles racing series is a bargain and a very well-run series that gives you the flexibility of your distance, a beautiful course and is the perfect way to kick-off the spring running season. I will run it again next year and you should too! Ok, last week I said that this week would include a Q1 progress update on my goals. So here goes. Here are the “physical” goals that I shared in my 12/30/18 blog post, my primary focus was to be a fit, healthy and impressive amateur athlete capable of significant and inspiring achievements. End my weight loss journey and maintain a healthy, comfortable weight between 189 and 199 pounds using the techniques that helped me be successful (tracking, good decisions). Current Status: I have mostly accomplished this. My weight went up a bit as my muscles have grown plus I am more sensitive to daily fluctuations because I am at my lowest healthy weight. But I am still, on average, in this range. Continue to improve as a runner by running 2 half marathons (April, October) and average one race per month with continually improving times. Get to a 5k pace consistently under 9 minutes by summer. Current Status: I am fully on track for this! I did skip a “formal” race in February but I am really doing well. The 5k pace is right at the 9 minutes mark too! Build a more structured workout routine and continue to build and shape my body while setting new personal records. Current Status: I need to get better at the structured routine but I have set, and am on track to meet, a new strength goal of being able to bench press 100+ pounds by 6/15. I have gotten as high as 90. I have seen my body building and shaping pay off and I grew my biceps by a half inch in 3 months. Try new things including yoga, CrossFit, climbing and other activities. Current Status: I did yoga a couple of times but didn’t stick with it. I have a friend who wants me to try spinning with her but I haven’t yet. I have friends who want me to come to crossfit with them but I haven’t yet. I just have to do it. I finished my book, started, my LLC and launched my ebook in March. That is exciting! People are buying it and I am convinced that I am really helping people. I have also made some progress with my “social” goal to be a great friend who makes efforts to keep in touch with and to be a source of support, fun and inspiration for my friends. Plus I work daily to make progress with my “intellectual” goal to be smart and happy by living a life of balance focused on growth, success and enjoyment while continuing to develop my knowledge of and confidence in myself. I give myself a solid B+ on this one. Lesson Learned: I set and am working on a lot of goals. Some are fully on track while others need some more focus in Q2. Overall I am pretty happy with 2019 so far! This week I launched my book on iTunes and Amazon so there are now 3 options to buy it. Each of them are linked from my book page. I have sold several copies so far and have heard positive feedback from my readers. Unfortunately the sales are slower than I had hoped though I had no real sales goal. I just wanted to get my message out there. Plus I haven’t done any true marketing beyond simply tapping into my amazing network of friends and connections. So I can’t be at all disappointed. Next up I am going to work to accelerate the production of the paperback. I have heard from several people that they aren’t eBook readers. Plus I have heard from people that they want autographed copies – I know, what?! So I am going to push to get the print version published soon. I just have to learn how to do that! Lesson Learned: it feels great to launch a book and to tell your story. You just need to figure out how to make sure you are reaching your target customers where they want to be reached. W. Edwards Deming is a popular name in both the scientific and management community and he had a major impact on the way we live today. Amongst other things Deming was an engineer, professor, statistician and a management consultant. He effectively created the concept of Total Quality Management and continuous improvement. Done correctly this cycle never ends. Whether it be leadership, operations, project management or just life you can always improve. If your goal is big enough you will need to keep adjusting to make it come to life. Let’s skip forward to today. This is the first week of April which means that the first 25% of 2019 is now complete and we are in the second quarter. This means you only have 9 more months, or 75% of the year, left to achieve those big goals that you set in January. Are you on track? This first week of the second quarter is the perfect time to focus on the second half of the Deming cycle. Check and Act. Leaders check! That is, they pause to measure progress. When you set those SMART goals at the beginning of the year they included specific measurements you were going to use to evaluate progress. Have you stayed on course? Take the next week or two to give yourself a performance review. Evaluate every goals that you have set. Find out where you are on track and where you are not. Also look for places that you are on track but could do even more. Leaders act! Once you have finished checking yourself it is time to act. Identify some steps you can take to get yourself back on track where you have slipped. Use a critical lens to see if any of your goals are no longer relevant. Then figure out some ways to celebrate your progress where you are meeting or exceeding your goals. Celebrating success is an important yet often overlooked part of the process. If you are leading a team this would be a good exercise to do with your team too. When I led teams I would have a quarterly offsite with the team to check, act and celebrate. Call to Action: take this first week of the quarter to Check your progress and Act to make sure you are killing it in Q2. The information and content in this website are not intended as professional medical advice, help, diagnosis, or treatment. Always seek the advice of your physician or other qualified health care provider before beginning any weight loss program. By using this website, you assume all risks.